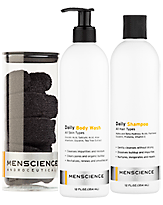 Your favorite men’s skincare products are available in comprehensive face, body and hair care kits. Always on the road? Travel Kit comes with 10 TSA-approved mini-products in a premium travel case.  Water-resistant nylon protects products and prevents leaks.  Convenient side handle allows for easy transport.  Top full-zipper design provides quick access to products.  Water-repellant material protects men’s skincare products from liquid damage.  Features multiple pouches for maximum organization.  Durable nylon is ideal for both short and long travel.